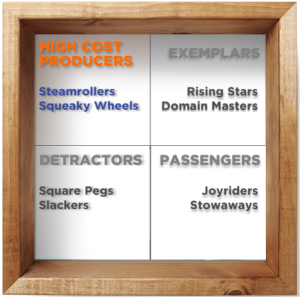 High Cost Producers carry more than their weight in delivering the team’s results but also incur a lot of costs in doing so. 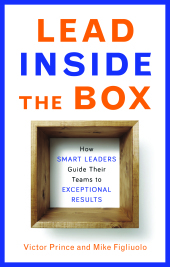 Your overall leadership strategy for this box is reducing friction. Over time you are going to reduce the amount of your leadership capital you are investing in this box and you will change what you are doing with that capital. Just like organizations do not have unlimited capital to invest, leaders don’t have unlimited time and energy to invest in leading their employees. Leaders’ time and energy, their “leadership capital,” is scarce and they have to invest it intelligently. Type 1 – “The Squeaky Wheels” – Squeaky Wheels produce above average results but seem to consume an above average amount of resources to do it. They are regularly asking you for more budget and staff. They frequently need your help fixing problems and figuring out how to do their jobs. Leadership Strategy – “Wean” – The goal with Squeaky Wheels is to get them to continue to deliver good results while reducing the resources they are consuming to get there. Make them less dependent on your help by making them figure out how to solve the problems they would often put in your lap. Type 2 – “The Steamrollers” – Steamrollers produce results on par with Exemplars but they seem to make a lot more noise while delivering them. They barrel through any hurdles and step on a lot of toes as they get the job done. They may not even realize they are affecting others negatively. Other team members complain about the Steamrollers’ bad behavior and the favored treatment you give them simply because they get results irrespective of the cost of achieving them. You often have to help heal the bruises they leave behind on others. You can’t imagine losing them, but you wish they were a bit less high maintenance. Leadership Strategy – “Reduce Friction” – The goal with Steamrollers is to continue to get the great results from them while reducing the toll their actions take on others. Over time, you can reduce the amount of effort you’re having to spend on High Cost Producers. In doing so, you should still get the same great results from them and have a lot more time and energy to invest in other members of your team.